USS San Antonio (LPD-17), the lead ship of her class of amphibious transport dock or landing platform dock, is the first ship of the United States Navy to be named for the city of San Antonio, Texas. The ship is designed to deliver up to 800 Marines ashore by landing craft and helicopters. Amphibious transport docks perform the mission of amphibious transports, amphibious cargo ships, and the older LPDs by incorporating both a flight deck and a well deck that can be ballasted and deballasted to support landing craft or amphibious vehicles. One could reliably say that the San Antonio is the F-35 of the surface fleet. She was launched in July 2003, a year late. She was commissioned in 2006 but plagued with problems and unable to make her first deployment on schedule. it wasn't until 2012 that the ship was actually fully capable of carrying out its mission after years of repairing design and materiel faults, a goodly amount of that due to shoddy workmanship. 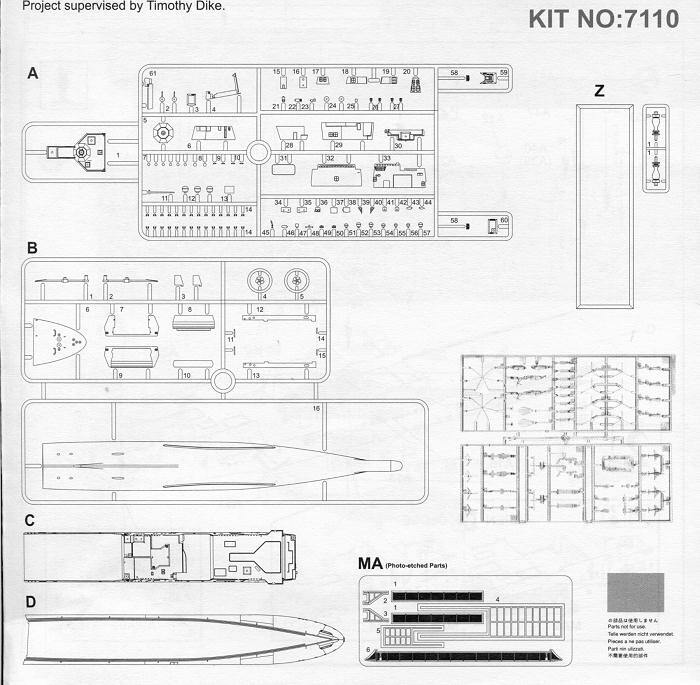 Other niceties are that the kit can be built either waterline or full hull and a display base is provided for the latter option. You are also provided with a number of vehicles to further enhance the kit. Though it is probably not appropriate to have all these on the ship at the same time, one gets CH-46 and CH-53 helos, MV-22 Ospreys, LCACs, M1 Abrams tanks, AV-8 Harriers, standard landing craft and AH-1 Cobra helos. Most of the helos have folded blade options. All of these vehicles are molded in clear plastic. The decal sheet provides basic markings for the aircraft as well as deck and hull markings. For a full rundown on the kit features, here is the list from the Cyber-hobby PR sheet. Cyber-hobby instructions are well written with the usual Gunze paint references. Now that we have one amphibious warship type, perhaps we will start to see something like oilers, ammo ships and standard cargo transports as well. After all, what wins a battle is as much logistics as it is firepower.